The world is social today, like it never was. Socio-viral development. Anyways, till yesterday we were the novice kids playing with our childish gadgets, while the adults and grown up professionals minded their Business as Usual. And suddenly every damn thing which has got anything to do with being cool is happening on social networking sites. And every business worth its salt is trying hard to cash on social media marketing. 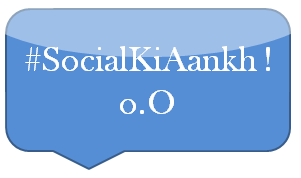 This section of aS, #SocialKiAankh aims to catch a few social media marketing attempts happening in the world and see what's good, bad, ugly and downright loathsome going on around!